During each semester, students will be expected to attend at least two field seminars. At least one field seminar each semester will be offered as an Out'N'About during the regular school hours. The field seminars are designed to teach students the skill of observation and qualitative data recording. Many times students are told what has happened within science rather than discovering what took place due to the knowledge they already posses. I hope to draw out this skill and confidence within each of the students. Knowing that some students will not be able to attend the second field seminar due to family constraints or schedule conflicts, each student will be given the chance to watch a video taken during the field seminar to respond to within the same field journal used on site. Though this does not have the same glamour or impact as the ability to experience the site with their senses, the videos will allow students a chance to see any or all sites. I encourage you to help your student to make any one or all of these field seminars this year. They are designed to be entertaining as well as educational. Please read through each of the field seminars below. Some seminars near the bottom may be pushed into the second semester based upon weather and the pace of the science classes within each unit. Star Gazing is a wonderful addition to the astronomy unit. We will be heading towards Vernonia to watch the night's sky. The focus of the night will be to look at different constellations and star clusters through available telescopes and binoculars. Each student will have access to binoculars; feel free to bring your own as well. The evening will start with a fun campfire and treats. 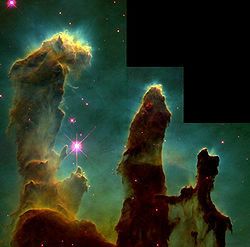 The star gazing will begin near 9pm. Families are welcome to camp (free of charge) or drive home after the initial star gazing activities. The best views come later at night. Date: September 17th (weather permitting) We will meet at the top of Stub Stewart State Park. There is a viewing area above all of the other campsites. Students should check in with me at the little covered area from 7:30pm to dark. If you have any questions, email me. Erosion is a constant force that many people do not notice unless they have lived in one location for many years, sometimes a lifetime. Students will be studying this concept within their Mineralogy unit, but will need to have measurements from before and after the winter months. 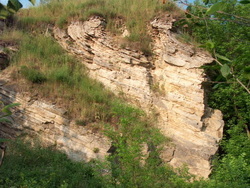 One group of students will attend this field seminar in the fall while the other group revisits the site in the spring. Students will measure the flow of the water, the height of the stream beds, and document any data that will assist the group to determine if erosion has occurred and to what degree. Date: October 6th. Half day OutNAbout. Bring appropriate clothing as it may rain. Igneous rocks in their greatest display come in the form of lava flows. Our most recent and closest neighbor, Mount St. Helens, has provided many beautiful outcrops and landscapes that will allow us to learn about how these eruptions took place and information we can learn about geography and the volcano itself by looking at and studying these different flows. Come join us and experience a wonderful hike as we travel through Lava Canyon and the Ape Caves surrounding Mount St. Helens. Date: October 15th, 2011 We will meet at the school's west side parking lot at 7:30am. If you need a ride, please contact other parents that are planning to drive their student. 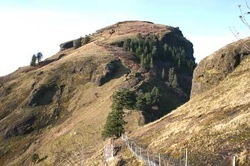 Not known for its seismic connections, Saddle Mountain is an example of inverted topography. What does that mean? Come with us and hike portions or all of Saddle Mountain to learn more about how the Oregon region has been formed and manipulated by earthquakes and plate boundaries. We will also be looking at rocks and how to identify a rock with other rocks of the same origin. I hope you can make it out with us. One of many field seminars, this particular field seminar will take place as an Out 'N' About. 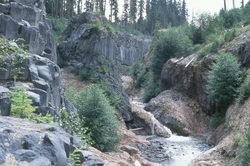 We will be focusing on an outcrop between the towns of Timber and Vernonia. Students will focus on rock identification and processes/changes associated with plate tectonics. Students will want to bring weather appropriate clothing as this will be a whole level trip. 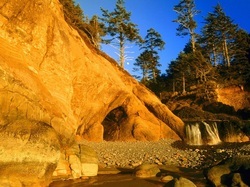 A beautiful section of the Oregon Coast, Hug Point offers the students a chance to see how erosion and weather have changed the surface of rocks and other layers of sediments. Students will also focus on how paleo-river/stream systems can be seen through the patterns of layering. A beautiful spot to enjoy the nature around us. Also a very good site for rock collection.